FINN Real Estate was started in 2012 and now CJV Real Estate, to create a locally-based Denver brokerage focused around community and life-long relationships. Patrick Finney of CJV Real Estate believes strongly in giving back to the community and has incorporated philanthropy into the mission of CJV Real Estate. See more about Patrick Finney giving back to the Denver community. 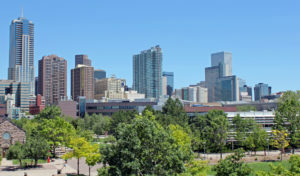 With ninety-four percent (94%) of our business in the City/County of Denver, consider us your Denver experts! After 10 years at RE/MAX and a smaller startup franchise, FINN Real Estate opened its doors in 2012. Our combined experience at FINN is 700 transactions and $250,000,000+ in real estate. Learn about FINN Real Estate’s team of Denver REALTORS. FINN Real Estate is a proud member of the Denver Chamber of Commerce. We also have obtained premier status on Zillow with a 4.9 out of 5 rating from over 75 reviews. Contact CJV Real Estate at 303-929-1333 or ClientCare@cjvrealestate.com to discuss buying or selling a Denver area home with a Neighborhood Expert REALTOR on the CJV Real Estate team.